Get out of town with these interesting San Diego side-trips: Wine Tours & Tastings (in Temecula), Lions, Tigers & Bears (in Alpine) and Carlsbad (The Miniature Engineering Craftsmanship Museum & LEGOLAND California). Next up on the itinerary: admire nature's wide array of creatures at San Diego Zoo, examine the collection at USS Midway Museum, take in nature's colorful creations at Balboa Park, and laugh and play at SeaWorld San Diego. To find other places to visit, traveler tips, maps, and more tourist information, go to the San Diego attractions planner. Bengaluru, India to San Diego is an approximately 27-hour flight. You can also do a combination of flight and train; or do a combination of flight and bus. Traveling from Bengaluru to San Diego, you'll gain 13 hours due to the time zone difference. Traveling from Bengaluru in May, expect nights in San Diego to be a bit cooler, around 19°C, while days are cooler, around 25°C. Wrap up your sightseeing on the 5th (Wed) to allow time to travel to San Francisco. Venture out of the city with trips to Wine Tours & Tastings (in Napa) and Muir Woods National Monument (in Mill Valley). There's still lots to do: snap pictures at Golden Gate Bridge, wander the streets of Fisherman's Wharf, explore the engaging exhibits at Exploratorium, and admire all the interesting features of AT&T Park. 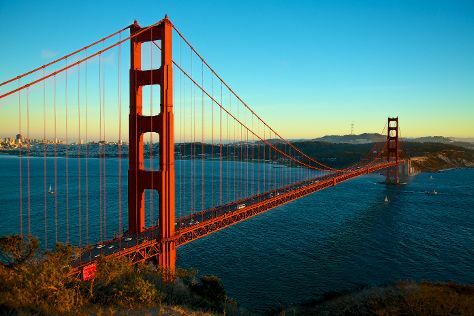 To see reviews, photos, maps, and other tourist information, read our San Francisco visit planner. You can fly from San Diego to San Francisco in 3.5 hours. Alternatively, you can do a combination of flight and train; or drive. Traveling from San Diego in June, San Francisco is slightly colder at night with lows of 15°C. On the 21st (Fri), you'll have the morning to explore before heading back home.